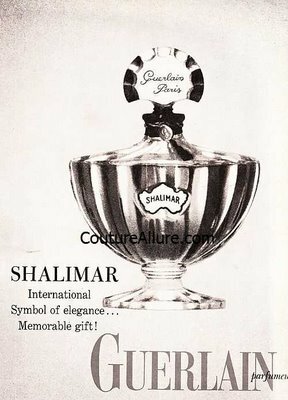 My introduction to Shalimar was two-fold: a vintage EDC that I won on eBay, and a bottle of extrait that my generous mother gifted me with. For nearly a year I’ve diligently bid on every reasonably priced bottle of vintage extrait that came up on eBay, but never come close to winning. In a rare twist of fate, I bid on and won both a vintage (un-opened!) bottle of Shalimar parfum and a bottle of vintage L’Heure Bleue EDT, for a laughably reasonable price. I nestled my little box of Shalimar in the back of the perfume cabinet, and forgot about it. Today, when I couldn’t decide what to wear, I reached for the little black and white encased purple velvet box. After dabbing it on, I thought, “Hey, this is great!” and decided to put a dab of the current formulation on my upper arm, for the side-by-side comparison. Next to the vintage stuff, the current formulation is sharp, astringent, and… chem-ih-klee. The vintage is so smooth, so organic (yup, that’s civit! ), so purrfect that it’s narcotic. I can’t keep my arm from my face, and am actually considering dabbing some on the tip of my nose to reduce the possibility of arm strain. So what’s problem? I’ve got a 30ml bottle, and a 7.5ml bottle of the new stuff, and a precious 7.5ml of the vintage (not including the lovely EDC). Does this mean I’m going to spend my days scouring the interwebs in search of back-up bottles of vintage parfum? Yeah, that’s what it means. Oh, dear. Yes. Yes, that’s what it means. If it helps, I feel your pain. Have you opened the L’Heure Bleu? (Asked without a hint…okay, a hint…of drooling…. I have opened the L’Heure Blue… and I’m still in limbo. I read too many reviews (which I’ve learned is a mistake) and now I filter what I smell through other people’s opinions.